Mark Taylor is considered an authority on market values and clock authentication and has a wealth of experience and knowledge in these fields. 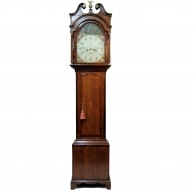 There are various criteria that we need to know in order to determine the value of your clock or barometer, some of these criteria are: condition, mechanical complexity, maker, aesthetics, authenticity and market demand. Whilst your item can be brought to our premises for appraisal or Mr. Taylor will be happy to visit your home, there is another method of valuation which is to use our unique Online Valuation Service. To use this service you will need to complete the form on the right as accurately as you can and include at least one picture. If the valuation is for insurance purposes then you should check with your insurer that an e-valuation will be acceptable to them. It is very important that you put as much information as you can and that photographs are added. 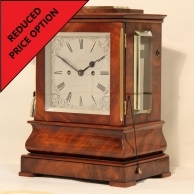 * THE COST OF EACH VALUATION FOR A SINGLE ITEM UP TO £6,000.00 IN VALUE, IS £36.00 INCLUSIVE OF V.A.T. The valuation will be sent to you by email in pdf format usually with 48 hours unless over a weekend. Please ensure that the email address you submit is correct and that you have made payment. The form on the right of the page is fairly straightforward to use. Most boxes have a drop-down menu with options for you to select but other boxes allow you to input all the information yourself such as 'Provenance'. Try to be near your item when completing the form and make it as accessible as possible to help you select the correct option. If you can't see certain things such as the type of escapement or don't understand the option then don't worry, just complete the form with as much information as you can and more importantly, send the best quality photographs that you can. Finally, before clicking on the black 'SEND' button, certify that all the details you have given have been true, that you are the legal keeper of this item and you agree to M.C. Taylor's Terms and Conditions by ticking the small box. The first details are yours such as name and email etc. 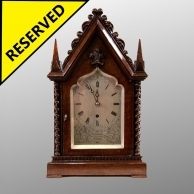 and there is also a box for the type of valuation that you require: Insurance is what the clock must be insured for against loss or damage and reflects the full replacement value of your clock and reasonable agent's fees. Probate is the expected and immediate selling value at auction, on the open market - almost a 'Sell it now' value. The Clock Title is what you call it and the Clock Description is how you would describe it to someone - you don't have to use technical terms. Next, click on the following drop-down box tabs so that all the options are shown, select the one that is most likely and then follow on until all the boxes have had an option selected (where practical), the more information that you can give us will help us to provide a more comprehensive valuation.. This means where the clock was made, sometimes it may say or have awards stamped into the backplate written in French or the maker and place written on the dial for example. 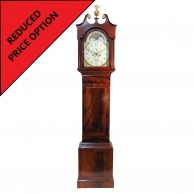 You can probably work out what type of clock you have by looking at our range of stock and the titles we have given them. This means how often do you have to wind it up, every day (30 hour) or once a week (8 day). This is a little more difficult unless you already know or it is written down on a previous receipt or something but as a guide, if you have a very long pendulum such as on a longcase clock it will probably be Anchor Recoil, if you have a French clock with an escapement that you can see working in the dial then this will probably be a Dead Beat and if you have a carriage clock or your clock works without a pendulum, it will have a Platform escapement. Just try to send us a picture of the bit of the clock that makes the 'Tick-tock'. 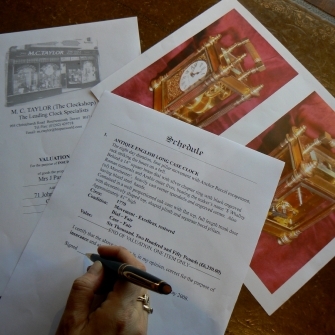 This is a description of whether the clock is a Timepiece only (doesn't sound the hours) or Quarter Striking (usually on 2 bells or gongs every 15 minutes), Striking (just sounding the hours and half hours), Quarter Chiming (several notes usually 4 or 8 every 15 minutes for example, Westminster chime) or, Musical (playing a full tune at intervals). This is literally the shape of the movement plates which are the main brass plates that hold all the wheels and other parts in place. This again is literally the shape of the main dial that has the hands and numerals to tell the time. It may be round, square, arched or have an arch that doesn't come quite to the outside edges - this is a 'Break-arch' shape. If it is arched but the arch comes to a point then it is a lancet shape. This means the base finish of the dial - the background. Is it Brass, Silvered (silver), Engraved (has lots of engraving) or is it actually Painted or Enamel. This is as it sounds, are the numerals Roman (a series of X's, V's and I) or are they Arabic (as we write them such as 1,2,3,4,5,6, etc.) or are they just Markings such as dots or lines? Describe whether they are Serpentine (the long minute hand will be curvey, snakelike), Matching (both the same only different sizes), Fleur-de-lys (having ends like the Prince of Wales feathers design), Spade (having kind of spoon shaped ends) or another design. This means what is the case made out of such as type of wood or brass or even gold plated. Ormolu is gold plated and usually you can tell because it won't have tarnished. If it has tarnished or you polish it then it is probably brass. If it is a black stone then it is probably Limestone. If the stone has colour or markings then it is probably Marble. This refers mainly to the top of the case, is it Architectural (coming to a sloping point) or is it Arched etc. All the other details boxes should be self-explanatory and literal. 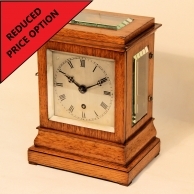 Give as much information as you can in the various boxes provided and also the clock's history in the 'Provenance' box as you know it such as ".....it belonged to my grandmother from 1903 to 1924 in Ipswich......." If we feel any information is relevant we will add it to the valuation. * TIP: If you are really unsure of any of the descriptions then photograph that part and send it. Make sure however that in the box you write "See photograph". Finally.........Don't forget to make your payment either by PayPal or by contacting us to pay by credit card, cheque or cash.